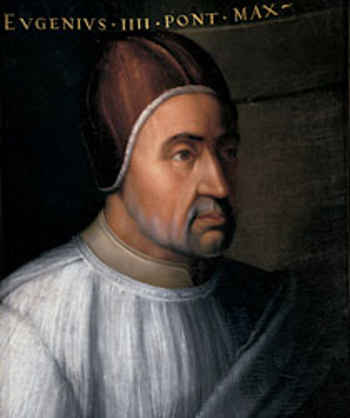 Pope Eugene IV (Latin: Eugenius IV; 1383 – 23 February 1447), born Gabriele Condulmer, was Pope from 3 March 1431 to his death in 1447. He is the most recent pope to have taken the name "Eugene" upon his election. By far the most important feature of Eugene IV's pontificate was the great struggle between the Pope and the Council of Basel (1431–39), the final embodiment of the Conciliar movement. On 23 July 1431, his legate Giuliano Cesarini opened the council, which had been convoked by Martin V. Canon Beaupère of Besançon, who had been sent from Basel to Rome, gave the pope an unfavourable and exaggerated account of the temper of the people of Basel and its environs. Distrustful of its purposes and emboldened by the small attendance, the Pope issued a bull on 18 December 1431 that dissolved the council and called a new one to meet in eighteen months at Bologna. The council resisted this expression of papal prerogative. Eugene IV's action gave some weight to the contention that the Curia was opposed to any authentic measures of reform. The council refused to dissolve; instead they renewed the resolutions by which the Council of Constance had declared a council superior to the Pope and ordered Eugene IV to appear at Basel. A compromise was arranged by the Holy Roman Emperor Sigismund, who had been crowned emperor at Rome on 31 May 1433. By its terms, the Pope recalled his bull of dissolution, and, reserving all the rights of the Holy See, acknowledged the council as ecumenical on 15 December 1433 except for the initial unapproved sessions that contained canons which exalted conciliar authority above that of the pope. These concessions also were due to the invasion of the Papal States by the former Papal condottiero Niccolò Fortebraccio and the troops of Filippo Maria Visconti led by Niccolò Piccinino in retaliation for Eugene's support of Florence and Venice against Milan (see also Wars in Lombardy). This situation led also to establishment of an insurrectionary republic at Rome controlled by the Colonna family. In early June 1434, disguised in the robes of a Benedictine monk, Eugene was rowed down the center of the Tiber, pelted by stones from either bank, to a Florentine vessel waiting to pick him up at Ostia. The city was restored to obedience by Giovanni Vitelleschi, the militant Bishop of Recanati, in the following October. In August 1435 a peace treaty was signed at Ferrara by the various belligerents. The Pope moved to Bologna in April 1436. His condottieri Francesco I Sforza and Vitelleschi in the meantime reconquered much of the Papal States. Traditional Papal enemies such as the Prefetti di Vico were destroyed, while the Colonna were reduced to obedience after the destruction of their stronghold in Palestrina in August 1436. At Florence, where the council of Ferrara had been transferred as a result of an outbreak of the plague, a union with the Eastern Orthodox Church was effected in July 1439, which, as the result of political necessities, proved but a temporary bolster to the papacy's prestige. This union was followed by others of even less stability. Eugene IV signed an agreement with the Armenians on 22 November 1439, and with a part of the Jacobites of Syria in 1443, and in 1445 he received some of the Nestorians and the Maronites. He did his best to stem the Turkish advance, pledging one-fifth of the papal income to a crusade which set out in 1443, but which met with overwhelming defeat at the Battle of Varna. Cardinal Cesarini, the papal legate, perished in the rout. Eugene's rival Felix V in the meantime obtained scant recognition, even in the Empire. Eventually Holy Roman Emperor Frederick III moved toward acceptance of Eugene. One of the king's ablest advisers, the humanist Aeneas Sylvius Piccolomini, who was later to be Pope Pius II, made peace with Eugene in 1442. The Pope's recognition of the claim to Naples of King Alfonso V of Aragon (in the treaty of Terracina, approved by Eugene at Siena somewhat later) withdrew the last important support in Italy from the Council of Basel. In 1442 Eugene, Alfonso and Visconti sent Niccolò Piccinino to reconquer the March of Ancona from Francesco Sforza; but the defeat of the allied army at the Battle of Montolmo pushed the Pope to reconcile with Sforza. Portuguese soldiers continued to raid the islands in 1435, and Eugene issued a further edict Sicut Dudum that prohibited wars being waged against the islands and affirming the ban on enslavement. Eugene condemned the enslavement of the peoples of the newly colonized Canary Islands and, under pain of excommunication, ordered all such slaves to be immediately set free. Eugene went on to say that, "If this is not done when the fifteen days have passed, they incur the sentence of excommunication by the act itself, from which they cannot be absolved, except at the point of death, even by the Holy See, or by any Spanish bishop, or by the aforementioned Ferdinand, unless they have first given freedom to these captive persons and restored their goods." The specific reference to Spanish bishops and Bishop Ferdinand of San Marcial del Rubicón in Lanzarote suggests that the Portuguese were not the only ones engaged in slave raids in the Canaries. Following the arrival of the first African slaves in Lisbon in 1441, Prince Henry asked Eugene to designate Portugal's raids along the West African coast as a crusade, a consequence of which would be the legitimization of enslavement for captives taken during the crusade. On 19 December 1442, Eugene replied by issuing the bull Illius qui, in which he granted full remission of sins to those who took part in any expeditions against the Saracens. Davidson (1961) asserts that "In Christianity as in Islam...the heathen was expendable". Richard Raiswell interprets the bulls of Eugene as helping in some way the development of thought which perceived the enslavement of Africans by the Portuguese and later Europeans "as dealing a blow for Christendom". Joel S Panzer views Sicut Dudum as a significant condemnation of slavery, issued sixty years before the Europeans found the New World. Pope Eugene is portrayed by David Bamber in the 2016 television series Medici: Masters of Florence. ^ a b c d e f g h i j k l m n One or more of the preceding sentences incorporates text from a publication now in the public domain: Chisholm, Hugh, ed. (1911). "Eugenius IV" . Encyclopædia Britannica (11th ed.). Cambridge University Press. ^ One or more of the preceding sentences incorporates text from a publication now in the public domain: Van der Essen, Léon (1909). "The Council of Florence". In Herbermann, Charles (ed.). Catholic Encyclopedia. 6. New York: Robert Appleton. Retrieved 23 February 2016. ^ Van der Essen, Léon (1909). "The Council of Florence". In Herbermann, Charles (ed.). Catholic Encyclopedia. 6. New York: Robert Appleton Company. Retrieved 23 February 2016.